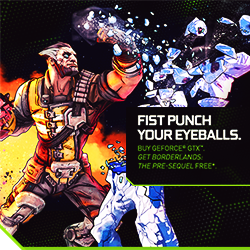 Experience the fist-punching visuals of BORDERLANDS®: THE PRE-SEQUEL™with the space-age power and performance of GeForce GTX! NVIDIA technologies like PhysX®, Surround™, and G-SYNC™ let you shoot 'n' loot your way through Pandora's moon with incredibly realistic and immersive effects. BORDERLANDS®: THE PRE-SEQUEL™ FREE when you buy a GeForce GTX 770, 780, 780 Ti, or TITAN Black.